Sticky Rice 2 has now opened at Grand Central Market. The Thai comfort food stall has added a noodles shop directly behind its stall. Grand Central Market is now open later on Thursdays, Fridays and Saturday nights to 9 p.m. Sticky Rice was doing brisk business on a Friday night. 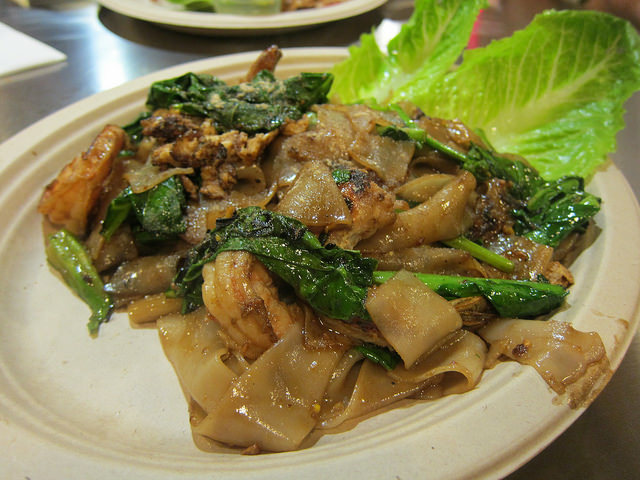 There are a couple of daily specials and the main offerings include phat thai (pad thai), phat siew (pad see ew), hoy ka noodles, pineapple fried rice, shrimp fried rice, spicy fried rice, khao soi and phat kee mow (pad kee mow). You get a choice of chicken, pork, beef or vegetarian. All dishes are $10 with the exception of the shrimp fried rice which is $15. There’s also dessert in the form of coconut custards served in bite-sized portions. On my first visit, I got the phat siew with shrimp ($4 extra). It was great with tons of tender Chinese broccoli. I was also impressed how spicy the phat kee mow was. They may give you a side eye if you order extra hot sauce on the side. You don’t need it! I returned for soup noodles the following week and took my to-go noodles to a quiet corner of the market. 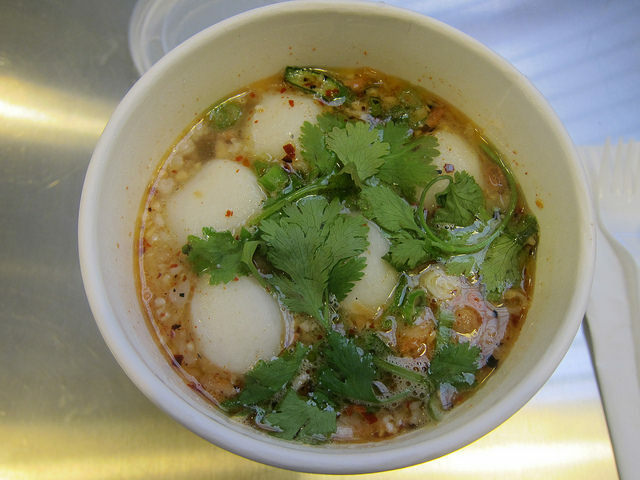 Sticky Rice has a specialist who only works on the hoy ka (tom yum) noodles. The counter lady said this chef knew all the secrets of the hoy ka noodles and no one else makes ’em. The pork-dried shrimp broth was slightly tangy and I loved the slightly spicy kick it had. It was subtle so add your marinated chilis to this soup if you’d like. The noodles also come with 5 wonderfully bouncy fish balls. I would have liked a bit more noodles but I could also get a side of their delicious papaya salad next time to add to my lunch. I can’t wait to go back to try phat thai and one of their fried rice dishes.